Is Australia your next target for a motorhome rental vacation? 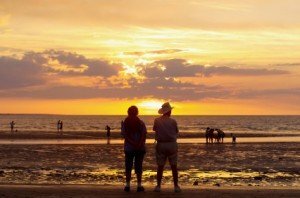 Motorhome rental in Australia is perhaps what you need to fully enjoy the unique Australian flavour. What better way to escape the hustle and bustle of a metropolitan life than to escape to the wilderness of Tasmania, where you can enjoy the breathtaking landscapes and spectacular beaches as well as the beauty and wild life of the mountains and lagoons. You can also explore the great boondocks of Otways Forest and check out the Twelve Apostles and other national parks along the route. Australia is generously populated with freedom camps, which are either free or low cost, and perfect for travelling in a motorhome rental in Australia where you can choose to retire and park at the end of the day and declare it “happy hour”. You can choose to retire and sleep for the night or socialize with other campers for a night of camaraderie. You can also find plenty of commercial campgrounds throughout Australia if you are looking for better camp amenities. When it comes to food, Australia has a huge variety of top quality food. Hence, shopping and preparing food for your motorhome or vw camper van rental in Australia will be a piece of cake. There are several places to buy food and most towns have at least one supermarket. The most popular of which is ‘Woolworths’ and ‘Coles’ but there are a plethora of others too like the smaller convenience stores. Most of their petrol stations also have built-in mini-grocery stores or convenience stores so food is not going to be a problem at all. Whether you just want to take out food or cook your own meal, the choice is up to you. Since Australia is such a huge and diverse country, you will be surprised that the weather can also vary dramatically from the North to the South. Hence, before travelling in a motorhome rental in Australia, make sure you have decided which place you want to explore so you know the perfect time to go there. For instance, Queensland has warm summers from December to February and mild winters from June to August. Sydney has a Mediterranean climate and is sunny from December to February and mild winter from June to August. Tasmania on the other hand has four distinct seasons- winter, summer, spring and autumn. A motorhome rental in Australia will be perfect for travelling the long and unwinding road of Australia. It is like having your own home on board, what with the bunk beds for resting and sleeping as well as foldable dining set where you can share a meal, and a built-in kitchen with all the necessary equipments for cooking such as a stove, fridge, microwave oven, among other things. You also get entertainment amenities like satellite TV and DVD player. What more can you ask for when everything is provided for you by your motorhome rental in Australia? Your job is only to enjoy the whole trip and build happy memories.